Monika Phartyal, Head – IT, 3M India Ltd and 3M Sri Lanka Pvt Ltd, shares the company’s digital transformation journey and the challenges along the way. 3M is on a business transformation journey that helps it acquire greater efficiencies in creating products and effectively engage with customers. Its business goals are driven by new technology adoption. 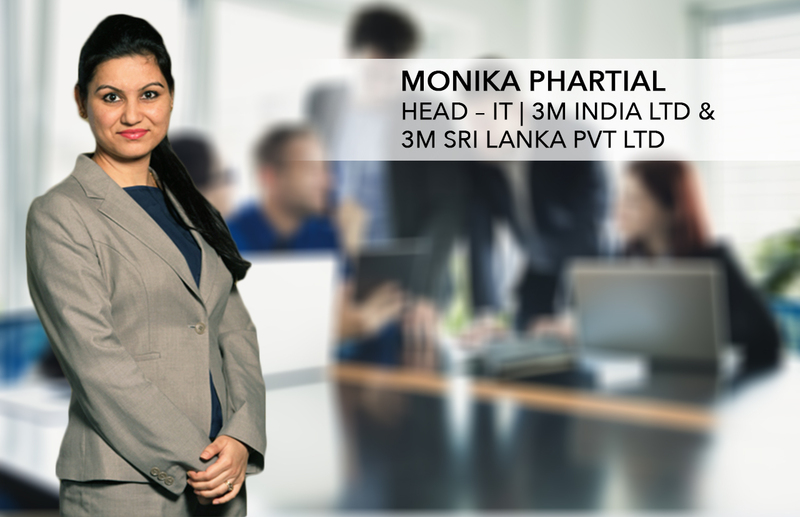 In this exclusive interview Monika Phartyal, Head – IT, 3M India Ltd and 3M Sri Lanka Pvt Ltd, shares with us the IT roadmap of the company and how emerging technologies can drive business benefits. You are managing IT for multiple lines of business at 3M. How do you manage to implement tech considering each sector has its own business and compliance challenges? As I look at it, digital realty, cognitive computing, and blockchain are becoming a reality today and are redefining IT and the business world. It took us a while to realise that treating systems as independent domains is limiting our quality and standards. So now, we are graduating from typically responding to disruptive opportunities with transformative initiatives within the technology domain to enabling disruptive technologies to work in tandem to meet strategic and operational goals. Each business in 3M offered its own exciting moments of complexities in design and implementation. We have managed to implement many customised and bolt-on solutions, which cater to the needs of diverse businesses. More importantly, we are looking at how they can complement one another to drive greater value and set the stage for business transformation. What are some of the key business imperatives of 3M in 2019 and how is IT helping achieve them? 3M is focusing on breaking down barriers of geography and processes in a bid to reshape the way we work as we set the stage for new products and services. This calls for a fundamental shift in business transformation while harmonising strategy, technology, and operational efficiencies, coupling disruptions around digital, AI, and automation. Keeping pace with the times, 3M IT is enabling an environment where technologies supporting businesses work in harmony. This involves our focus on each line of business from a business processes and enabling technologies perspective. What could be more exciting than this? At what point of your digital transformation journey are you today? What were the challenges you faced during transformation and what were the lessons learned? Oh, we have come a long, long way! Earlier, we focused on improving productivity, efficiency, and efficacy of people and business operations. We have had been automating a lot of standalone processes, building gaps in compliance issues, adapting to cloud, collaboration tools, and sales force. We are reinforcing the analytical power with BI, SAP HANA, mobility, IoT, chatbots, etc. The biz-o-logy (business + technology) re-engineering helped us understand our capabilities and transformational needs. Here our focus is on four key areas. > We have adopted managed infrastructure services, with DaaS, SaaS, cloud printing, cloud storage, digitising workforce disk space and an online collaboration and communication platform with improved security. > Automation of all processes enables sealing of all compliance issues and leakages. > We are developing internal capabilities in our understanding of the domain and adoption of industry best practices to deliver value and process efficiencies. We are also upscaling our associates’ skills with project planning and execution under scrum and agile methodology to mitigate risks. > In the VUCA world, business priorities keep changing. The span of imminent needs is shortening; this demands a highly flexible execution approach. This presents lots of challenges in terms of prioritising the assignment and managing the budget to keep up the pace. We learnt as we progressed, and our traditional approach kept blurring. We managed to create a diagonal view of the business, technology and systems that would help us look at newer business opportunities and adopt newer and creative ways of addressing issues. Change management is so much part of a CIO’s job. What are the factors that are critical in getting employees to embrace change? This is a very essential topic, virtually ‘terrorising’ the entire gamut of the workforce. On one side, automation and technologies are gaining traction and easing the business while exploring new ‘unthinkable’ opportunities. Yet, on the other hand, it is tending to reinvent people’s roles. Automation is steadily marching towards greater adoption and workplace roles are splitting into human managed roles, technology augmented workforce roles and new generation ‘virtual workforce’ roles. This new challenge prompted HR specialists to work on reskilling the augmented workforce and redefine workplace practices to manage the new ‘no-collar’ workforce for an ‘augmented performance’. While redesigning the entire gamut of people practices, HR is also re-positioning itself into an agile and dynamic function; more positioned to support talent from the business perspective. As for people, we are beginning to realise the potential of technology and have started adapting to the ‘man and machine’ relationships. Using our social, perspective, and cognitive abilities we are graduating to a symbiotic relationship. We aim to innovate and improve efficiencies and decision making in order to stay ahead of the competitive landscape. We need to gear up to brace ourselves to shift our focus from the fear of technology to the realms of opportunities. What are the new projects you are working on and how will these transform 3M’s business? Our priority today is to improve digital engagement with our customers and business partners while leveraging the interconnected capabilities of back office systems with customer facing systems. This mother-of-all interdependency will make pricing, supply chain and financial info reside with the sales and after sales service operations. We are already celebrating the ‘digital déjà vu’! We are keen to implement IoT coupled with AI to support the new seamless customer experience to strengthen the brand. We are defining the big technology plays by modernising ERP and converging latest technologies (human/AI). This will unlock an incredible amount of value for business as it becomes integrated into standard processes, leading to unprecedented productivity gains. We are also turning our attention to expanding connected devices on cloud and attempting presence in ecommerce as the next areas of opportunity to create high quality delivery.